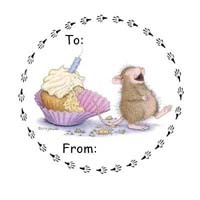 Your Favorite House-Mouse Designs® images on 2" round To / From stickers. They are printed on our white peel and stick paper. The sheet has 20 To / From stickers. Each sticker is a 2" circle. Click on any link below. Click on any of the links above to check out our really "Mice" To/From Stickers.